PANOSUN Ltd - TickCard™ – safe, quick and correct tick removal. 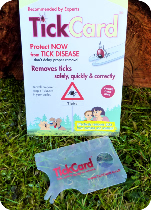 TickCard™ – safe, quick and correct tick removal. Discounts Apply: 50 Pence off each on 3 or more! The ideal gift and must-have item for the gardener, walker or outdoor worker. Removes big and small ticks – safe and easy to use. No need to use pincers or tick-tweezers! 1. Slip the notch of the TickCard under the tick. 2. Lift the front of the card slightly and then gently push the card forward. 3. Allow the tick to let go and be pulled out of the skin easily and effortlessly. Remove small, not yet engorged ticks and bee stings with the smaller notch – it can also be used for thorns and splinters. "The TickCard is absolutely PERFECT!"